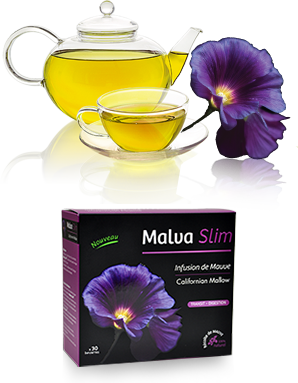 Malva Slim ® is an herbal diet that is 100% natural. The purgative, laxative and emollient properties are facilitated by its richness in mucilage. Mauve, Latin name Malva Verticillata, is traditionally used for the relief of constipation. "Malva Verticillata" is the only ingredient of Malva Slim ®. It can be used as a tea infusion or ingested as capsules. Selected leaves are carefully sorted, dried and packaged. Malva Slim ® is recommended to patients with severe constipation. Malva verticillata is from the Pharmacopoeia of America, used for years by the indigenous peoples. It originates from America, Thailand, and Indonesia. On average, it takes about seven years to complete the first maturation. At this stage, the active ingredients are released. Californian Mallow or Malva Verticillata is a rare plant harvested on lands facing south (Borrego Valley, California). Malva Verticillata is the only ingredient in Malva Slim ®. Once brewed, its effect facilitates the removal of excessive fat deposits and waste products from the metabolism.